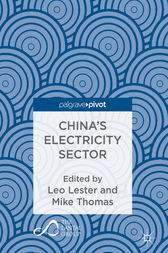 This book provides a concise introduction to China’s electricity sector, suitable for university students and business analysts. It is business focused, combining an introduction from an established regional electricity consultancy with five academic chapters covering governance, market stakeholders and reform, wind and solar power, environmental regulation, and developments in financing. It is written in an accessible but rigorous style for people with limited knowledge of the topic, with minimal jargon but full referencing throughout the academic chapters. Each academic chapter starts with a summary and three key points to guide the reader’s understanding. Leo Lester, a Principal at The Lantau Group, has over a decade of international experience, first with a multinational oil and gas company and later a Saudi think tank. He holds degrees from the Universities of Oxford and Reading, and is a CFA charter holder and certified Financial Risk Manager. Mike Thomas, a Partner at The Lantau Group, is an expert in the rigorous analysis of energy sector decisions, including how or whether to regulate, how and when to rely on market forces, and the evaluation of opportunities and risks. He has an MPP from Harvard Kennedy School and a BA from Carleton College.